Jarrow Formulas Organic Brown Rice Protein Concentrate Vanilla: this finely milled protein concentrate is naturally processed from sprouted non-GMO (Genetically Modified Organisms) brown rice to be easily digestible and to mix well in beverages. It uses both the rice bran and the germ to provide a complete amino acid profile making it a high quality protein source with a score of over 100% for almost all amino acids. who can benefit from Organic Brown Rice Protein? 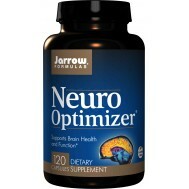 This vegetarian/vegan product is a great alternative to soy and animal products as a source of complete protein. Brown rice protein is also naturally hypoallergenic for those who have sensitivities to milk, wheat or soy products. Brown Rice Protein Concentrate, is made using an all natural process that does not involve the use of chemical solvents. One serving of Brown Rice Protein provides 12 grams of rice protein. : when utilizing the protein from both the bran and the germ, brown rice possesses a complete amino acid profile. This includes lysine and methionine, which are important essential amino acids often lacking in vegetable source proteins. 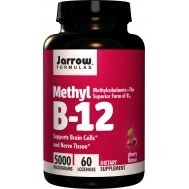 Jarrow Formulas Brown Rice Proteinhas a number of advantages to offer as a protein supplement. First, unlike whey and soy proteins, rice protein tends to be easier to digest. 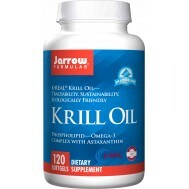 It is also a vegan protein source, and so acceptable to any type of vegetarian. Furthermore, rice protein is infinitely suitable for people on gluten free diets since it contains no gluten. In short, it is an excellent high-protein alternative to milk-, wheat-, and soy-based proteins, or any other type of protein for that matter. Although many people may be used to thinking of rice as a carbohydrate, it is an excellent source of protein as well. It is even possible to separate the rice protein from the carbohydrate fraction. Jarrow Formulas’ Brown Rice Protein is extracted using an all natural process that does not use chemical solvents. The process involves brown rice being treated with enzymes that separate the carbs from the proteins. These enzymes are considered vegan and the processing of rice in this manner is considered a “raw food” technique. The rice proteins are then milled into a powder. Plain, unflavored rice protein powder has a neutral, slightly sweet flavor that many find superior to soy. However, when mixed into liquid it typically has a “gritty” mouthfeel that some find objectionable. This is not a problem with Jarrow Formulas’ Brown Rice Protein, for which a special milling process is utilized to produce an ultra smooth texture that mixes better and is less gritty than traditional rice protein preparations. Some individuals may have concern about the nutritional value of rice protein since it is not ordinarily a complete protein. 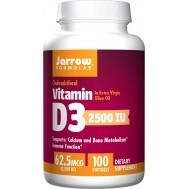 However, Jarrow Formulas’ Brown Rice Protein utilizes the protein from both the bran and the germ of the rice grain, collectively providing a complete amino acid profi le. This includes lysine and methionine, which are important essential amino acids often lacking in vegetable source proteins and white rice. 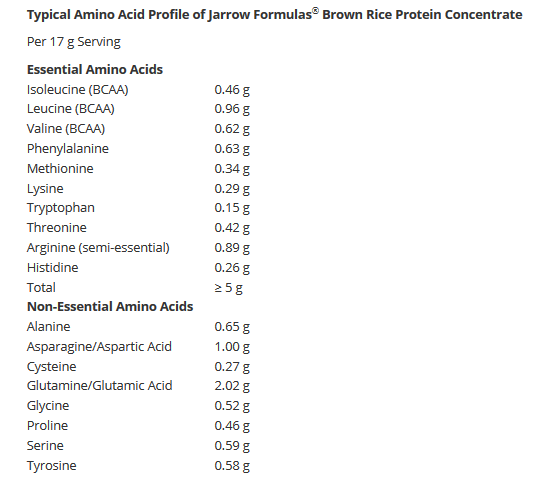 Jarrow Formulas’ Brown Rice Protein is specially processed to allow protein quality scores exceeding 100% for almost all the amino acids in the product. In addition, research shows that rice protein is highly digestible. Research has demonstrated that brown rice protein is extremely safe, and lacking in acute toxicity. While there are isolated cases of allergy to raw rice, in general it is considered non allergenic, or hypoallergenic. 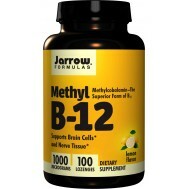 Furthermore, Jarrow Formulas Brown Rice Protein comes from a non-GMO rice source. 4) there could be unforeseen local and global effects caused by transgenic organisms proliferating. While these issues are sorted out, concerned customers will be pleased to know that Jarrow Formulas Brown Rice Protein utilizes non-GMO rice. In one study conducted by the Arkansas Children’s Nutrition Center, weanling rats fed mostly rice protein diets were more likely to demonstrate greater sensitivity to insulin, which promotes blood sugar and overall metabolic health. The researchers concluded that there may be benefit to deriving some protein from vegetarian sources, such as rice protein, in addition to that from meat, dairy and eggs. In another animal study, the feeding of rice protein led to healthy arteries, suggesting value for promoting cardiovascular function. 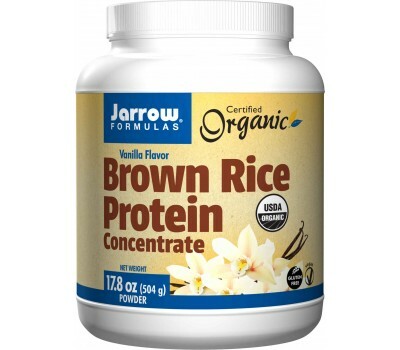 Jarrow Formulas’ Brown Rice Protein, made from whole grain brown rice, is easily digested, gluten-free, hypoallergenic, and a vegetarian/vegan source of protein. It is specially processed to provide a complete amino acid profile with protein quality scores that exceed 100% for almost all of the amino acids in the product. Jarrow Formulas’ Brown Rice Protein is made using an all natural process that does not use chemical solvents. A special milling step produces an ultra smooth texture that mixes easier and is less gritty than traditional rice protein preparations. take 1 scoop and mix it with 250 ml of liquid (water or acidic fruit juice) and drink it at breakfast or as directed by a qualified physician. Do not take this product just to lose weight but rather as alternative protein source when you are allergic to cow's milk or soy protein.